Osteoarthritis is a highly prevalent joint disease that primarily affects the elderly (see Figures 2.4 and 2.5). The increasing importance of imaging in osteoarthritis for diagnosis, prognostication and follow-up is well recognised by clinicians and osteoarthritis researchers. While conventional radiography is the gold standard imaging technique for the evaluation of known or suspected osteoarthritis in clinical practice and research, it has limitations that have become apparent in the course of recent magnetic resonance imaging (MRI)-based knee osteoarthritis studies . Of the common imaging techniques, only MRI can assess all of the structures of the joint (ie, cartilage, meniscus, subarticular bone marrow and synovium) (Table 5.1), and thus can show the knee as a whole organ three-dimensionally and directly help in the assessment of cartilage morphology and composition. This imaging modality, therefore, plays a crucial role in increasing our understanding of the natural history of osteoarthritis and in the development of new therapies. 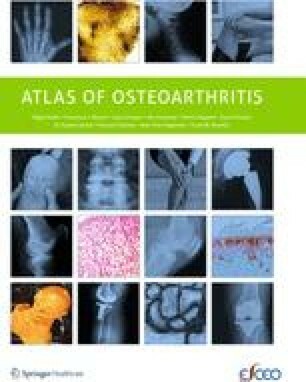 The uses and the limitations of conventional radiography, MRI and other techniques such as ultrasound, nuclear medicine, computed tomography (CT) and CT arthrography in the imaging of osteoarthritis in both clinical practice and research are described in this chapter.